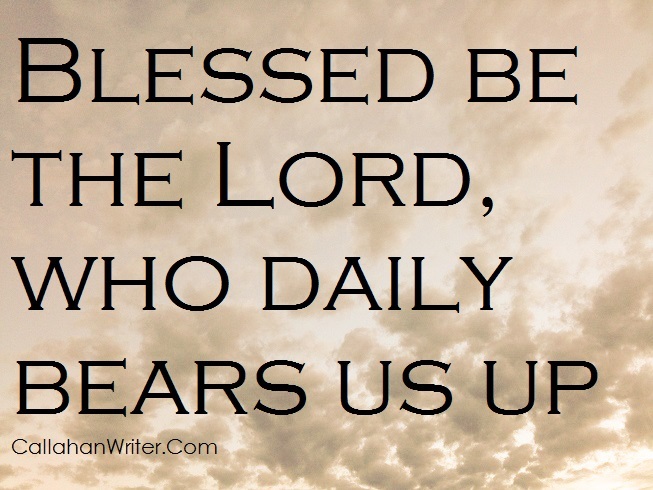 The Lord Daily Bears Us Up | Troy C. Wagstaff aka CallahanWriter Blog: Topics of interest include Western Historical (1865-1899) Topics. Additionally inspirational Christian and Fibromyalgia interests. This delightful quote comes from the Bible and is popular among those who create Christian memes or graphics. Is sounds hopeful and it praises The Lord. There is more to this simple and profound Bible quote. When you understand it better, you’ll have a new and even more profound appreciation for this wonderful verse. Look at the Greek meaning for the word “bear.” It means “bear with,” “remove” or “endure.” So let’s read this verse with the Greek meaning. These versions don’t make complete grammatical sense however these Greek meanings add to the meaning of the verse. Let’s look at the traditional sense of the verse as it is in the Christian picture. Blessed be the Lord, who daily keeps us standing, gives us strength or hope, keeps us going on the right path. Now lets look at the additional meaning of the verse that the Greek words provide. The “bear(s) with” means that daily (every day!) The Lords bears with us, or puts up with us. Is this really much different? I think so, because it implies that He puts up with us rather than just cast us off because He gets tired with our redundant bad behavior. He’s loving us all the time and does what He can to be with us always. If we need him (we always need Him), He is right there. In the case of the word “remove,” I don’t see how it works in this verse but the word “bear” appears throughout the scriptures so it’s worth mentioning now for use later on in your Bible reading. In the application of “bear” or “remove” could refer to the removal of sin through our repentance and His mercy and grace. It could also mean that He removes barriers, trials or other problems we may be involved with. In the third application using the word “endure” makes a lot of sense in this verse and could make a lot of sense in other uses throughout the Bible. The Lord daily “endures” with us. It speaks to the longsuffering quality of our Redeemer’s love for us. Not only do these Greek meanings add some to this great Bible passage but it aids in understanding other passages in the Holy Scriptures.